fitting headphones substantiate the sweetness of music. Comfort is a relative term for different people but some headphones are the ear-whisperers. They close over your ears like a snuggly blanket and wrap you in the beautiful audio. They become inconspicuous on your head. The differences in audio are subtle but the differences in comfort are immediately noticeable. Sometimes, there’s an ever-so-slight pressure on ear cartilage or undue warmth of earpads or unnecessary pressure of the headband that muddies your listening experience. Our point is that you need not settle for this subpar performance when you have the top 10 most comfortable headphones listed here for you. What are the characteristics of the most comfortable headphones? Earpad comfort:Since earpads make immediate contact with the ears while using headphones, they were the first filter. We prefer those materials which feel soft to the ears. But they should also be well-ventilated for prolonged usage. Velour is the choicest material for ear pads. The furry comfort is hard to say no to. It is also more porous to air-circulation than leather, so your ears remain relatively dry. In case of leather, always prefer genuine leather. It whups velour in terms of durability but it is not as comfortable. Headband comfort:Another equally important factor in headphone comfort is the headband. Headband design is a dicey science. It should be tight enough to stay stable over your head and should keep the earcups positioned correctly over your ears. But it should not be so rigid that it clamps down heavy on your ears. After you take off the headphones, you shouldn’t feel like your ears are falling off. Headphone design: Headphones could be over-ear or on-ear.Comfort-wise, over-ear headphones take the cake. On-ear headphones apply some small pressure on ears. Headphone design in terms of where the controls are placed, the position of the mic relative to your mouth and general usability is of consideration. Nonetheless, we’ve identified and ranked 15 highly comfortable headphones from both on-ear and over-ear categories. Weight: The headphone rests on your head. You would not want to carry the enormous weight there, as head happens to be a very important part of the body as demonstrated by the Headless Hunt in Harry Potter (You can play Head polo with it). The lower the weight, the better you will feel over long hours of music listening especially if you are a music producer. But the weight loss should not be at the cost of build quality. Wireless Comfort: Being free of wires is an enormous comfort. How many times have you gotten up for water and yanked your headphone cable in the process. Being free of wires means you can move freely around the playback source within the Bluetooth range. There will be no threat of sending your phone flying every time you jerk your head. Noise-cancelling capability:This might sound diva-like (without any external noise though) but the noise-cancellation features really help. Imagine how much more enjoyable Blank Space would sound if it is not interspersed with your cousin’s whining. Active Noise Cancellation is a must if you are travelling by air. How do on-ear and over-ear headphones differ in terms of comfort? On-ear or supra-aural headphones have smaller earcups that sit ON the ear. Over-ear or circum-aural headphones have earcups that sit around the ears. We explain the advantages of both to differentiate between them. We have also written extensively about the most comfortable in-ear headphones, widely known as earbuds. Portability: On-ear headphones are smaller and hence more portable. If they can fold, even better. They’ll fit in a much smaller case than full-blown over-ear headphone. And the larger the over-ear earcups, the higher the chance of damaging them during transport. Portability is the one greatest advantage of on-ears over over-ears. Breathability: Over-ear headphones cover the ears whole. They close off the sir supply to ears unless they are open- back. Even then, they can make the ears steam. On-ear headphones occupy an area on your ears. They leave out scope for air to enter the ears andwick out the sweat. That being said, on-ears can sweat the ears after long hours of use too. Weight: Since on-ear headphones are smaller, they are also usually lighter and feel less intruding on the head. Awareness: On-ear headphones isolate you from noise only partially. They allow you to stay aware of your surroundings. When you are out in the city and need to keep track of traffic or in the office when you want to keep an ear out for your colleagues. For working out, on-ear headphones might fit some folks better than over-ears, although in-ears are the best choice for an active lifestyle. Glasses: Spectacles get in the way of over-ear headphones. The arms get in the way of a proper seal. With on-ear headphones, this isn’t much of a problem unless the clamp is heard. 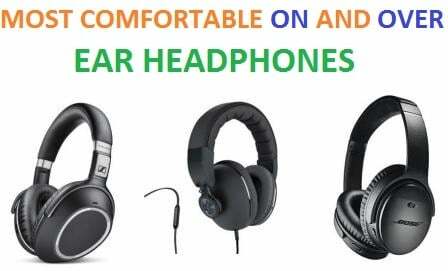 The comfort of on-ear headphones depends on the shape and size of your head and personal preferences. In spite of their smack dab position on the ears, some people like them better than over-ears. Clamp-free ears: Since the cups of the over-ear headphones encircle the ears, they usually don’t form any pressure point ON the ears. On an average, people find this more comfortable than on0ear headphones that apply pressure on the ears. Seal: Over-ear headphones sit around the ears and provide an excellent seal. The audio doesn’t leak much unless it’s an open-back headphone. You can find some peace even in a crowded subway terminal without spending on active noise cancellation. Spacious: Over-ear headphones sound a little more spacious than the on-ears usually. Since the drivers are farther from the ears in over-ears, sound reflects off the earcups and creates a sense of space. On-ears sound more closed-in and electronic while circum-aural headphones sound natural. Which are the most comfortable headphones? Comfort:Duh! But seriously, we considered all the factors mentioned above in our pursuit of comfort. Each factor was closely monitored and concessions were made if one covered for the other. Audio: We are talking headphones. The ultimate aim is to listen to music. Once we established that the headphones are comfortable to wear, we ensured that they sounded worth the pain of a perfect design. Budget: With present advancements in engineering you do not need to be paying exorbitant amounts for comfort. There are ways to create headphones that are easy on ears and we picked the most comfortable headphones that exploit them. Features:Headphones with convenient features always make music-listening a pleasure and also contribute to comfort. Noise cancellation is one such feature. Bluetooth connectivity, replaceable wires, inline mic etc. all earn brownie points. line is guilty of building intriguing audio into a flawless design. With an option to use as a wired headphone, Bose has internalized the battery and made QuietComfort 35 a hassle-free peripheral. The Active Noise Cancellation(ANC) and audio are bigger and better than the predecessors. The build is more robust and the battery life hits the high range. We have one too many reasons to give it the top spot on our most comfortable headphones list. What makes Bose QC 35 the most comfortable headphones in the market? Once we created a checklist for determining the comfort level of headphones, we realized that Bose QuietComfort 35 was popping around like Jelly bean inside our brains. It ticked so many of the right boxes. Earpad comfort: Bose QuietComfort 35 headphones sport oval-shaped earcups and earpads. These are padded with generous cushioning and sheathed in leather. The end design is well-ventilated and fits really well. Round earcups tend to press on the top of the ear and cover some area on either side of the ear unnecessarily. The oval pads fit better around the ears. Headband comfort:Compared to QC25, the Bose QC35 headphones have a wider headband which relieves some of the clamp force and uses the width for better stability on the head. To add to the comfort quotient, it is also padded and finished with leather. This creates a nice soft feeling on the contact points of the headband. Headphone design: Bose QuietComfort 35 headphones resort to the famed over-ear design. This is crucial to their noise-cancelling ability as well. We did not sweat much with continued use of the headphones. Weight: At 234g per headphone QC35 is one of the lightest over-ear headphones in the market. But it added significant ounces over its predecessor, the QC25, which weighed only 196 grams. But QC35 has invested the increased weight well. It goes into making the frame sturdier and the headband broader. Wireless Comfort:QuietComfort 35 headphones swagger around in their wireless pajamas. The ANC functionality also kicks in when the headphones is tethered wirelessly. But in case you run out of power, they have a 2.5mm port on one earcup. You can use the supplied 2.5mm-3.5mm audio cable to play music in wired mode. Noise-cancelling capability: This is the finest bow in Bose QC35’s arrow. With these headphones, it gets as quiet as the calm before the storm, only there’s no storm. You might take time to adjust to absence of noise when you wear these. It completely filters out the low-frequencies hums from engines, motors, AC etc.. Even at low volumes, the drone is successfully suppressed. ANC option cannot be switched off. But it works only in the Bluetooth mode. The speaker plate of earcups is made of metal while the rest of the frame is all plastic. There is no questioning the durability of Bose QuietComfort 35 headphones. All buttons are placed on the right earcup. There’s a power button that doubles as a Bluetooth connectivity control. Off to the sides of one cup are volume buttons. A multi-functional control is used to Play/Pause, Answer/Reject and issue vocal commands. QC35 commands a battery power of 20 hours per charge cycle. This is with the ANC on all the time. The headphone itself does not have automatic power off feature. But you can utilize the Bose Connect app, a companion app for the headphones to engage automatic power off option. You can even alter the idling period here. Both earcups of QC35 fold flat and one folds inwards. This makes a flat package out of it which is easy to stow in the top zip of the spinner. For convenience, it also shipped with a hardy hard case. It can house the accompanying 3.5mm cable and airplane adapter. The mic-quality is superb. Making calls is a clear and frustration-free experience on QC35. It has the mic-monitoring feature that feeds your voice back to you, so that you don’t misjudge your volume and shout on the phone. We took a fancy to the double-toned silver model of QC35 compared to the plain black one which is also classy. If being noise-free is your biggest priority, Bose QuietComfort 35 headphones are the best you can get. Bose combines this ability with a balanced audio. All the conversation around you dies when you are on the streets. It uses a digital equalizer that balances the elements of audio. Bose is benevolent with the lower-registers. You get meaty bass underscoring the sound. This makes the music more enjoyable without muddying the midrange. The bass is not as taut as that of Sennheiser Momentum wireless but the latter is no match in ANC. The midrange and highs of QC35 are accurate and reined in by the equalizer. Bose takes the safe route with its audio and keeps the abnormalities in check. Noted audiophile headphones like Momentum offer a little more clarity and less digital voodoo which makes their audio a more natural. But Bose QuietComfort wipes the floor with them in terms of comfort and ANC. headphone which is a lot like it. 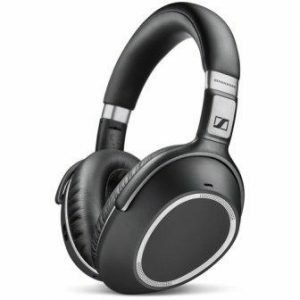 The Sennheiser PXC550 is your jam if you are a big Sennheiser fan and want Bose-like Active Noise Cancellation. It was released as a head-on competition to the Bose QC35. Audio-wise Sennheiser gets the cherry. With regards to comfort, Bose leads by a point. Either way it’s a boon for the most comfortable headphones list. What makes Sennheiser PXC550 the most comfortable headphones in the market? Sennheiser aimed the PXC550 headphones at the travel crowd. So they did everything to make sure that these headphones are primed for comfort. Earpad comfort: Sennheiser PXC550 headphones use a 1-inch thick padding on the earcups with synthetic leather covers. The padding is so abundant that if you sleep on them, you feel like you have a pillow under your ears. But the thickness of the cushion does not let jumbo ears sit completely inside the earcup cavity. This is the only area Bose beats Sennheiser. Their soft padding can accommodate large ears without pressing on them. Even so the difference is barely noticeable between the two. Headband comfort: The headband of PXC550 headphones is only moderately wide. But the cushioning on it is above par. It rests ever so lightly on your head when you are reclining in your airborne seat. The clamping pressure is also optimum. The force is enough to sustain the headphones on your head but not more. Headphone design: As usual, Sennheiser has opted for the over-ear headphone design. The earcups are egg-shaped and they contour the ears better than oval and racetrack oval designs. In fact, it fits small and medium-sized ears like a glove. Weight: The Sennheiser PXC550 headphones weigh a mere 227g. They weigh a smidgen less than the Bose QuietComfort 35. It does not make much of a difference and both qualify as lightweight headphones in wireless category. Wireless Comfort: Bluetooth 4.2 lends wireless connectivity to the PXC550 headphone. The wire-free performance is stable with no connection dropping issues. Noise-cancelling capability: Sennheiser built Active Noise Cancellation into the PXC550 headphones. But they did it with style. There are two ANC modes set by mode button on the earcup. One is the Silence of the Lamb style full-blast ANC. The other one is an adaptive ANC mode. This mode regulates the amount of ANC done on your audio. So if you are in a quieter environment, there will be less digital tweaking of their audio and less pressure on your ears from the circuits whizzing. There’s a CapTune companion app for these headphones that allows you to further control ANC levels. Bose QC35 still takes the crown for best ANC but PXC550 is close to catching up. Sennheiser charges premium for the PXC550 headphone for a reason. It is packed with hi-tech features. The required buttons are placed discretely. The right earcup has a capacitive surface on its back side that can be used to control music.PXC550 also has motion sensors that pause the audio when you take it off. It is turned on when it is unfolded. Its arms fold to be packed inside its sturdy hard case. The PXC550 headphone can survive up to 30 hours on a single charge with ANC on. That’s more than Bose QC35 can do. It has built-in mics which allows you to take calls on the go. The same mics also allow you to eavesdrop. You can tap the earcup twice and activate an external mic which pauses music and picks up external conversation. You can use this to listen to someone when they beckon you, without taking PXC550 off. Sennheiser never disappoints with audio. PXC550 has a decadent warm quality that makes music-listening and absolute joy. The lower-registers have some energy to them which handle the complicated bass tracks with ease. The extra punch that they have was missing in Bose QC35. However, the mids and highs have a tad more definition on QC35. That being said, Sennheisers never sound dull or clinical. The audio quality sounds different from track-to-track but Sennheiser remains on the winning side in most tracks. For an ANC headphone, the audio of PXC550 is quite accurate and natural sounding. Its cost makes Bose QC35 look reasonably-priced. If ANC and budget are not top on your list, PXC550 is the way to go. which provide maximum acoustic value for their money. The audio is as dynamic and refined as it gets in cans in a higher price range too. These are totally meant for audiophiles and die-hard music-maniacs because of their open-backed design. Since they are for indulgent listening they have been designed to be one of the most comfortable headphones in the market. What makes Sennheiser HD 598 the most comfortable headphones in the market? In spite of being a headphone of moderate budget, the Sennheiser HD 598 has comfort off the charts. They have struck a concurrence between light weight, durability and price. Earpad comfort: We like the HD 598 headphones out of the mix mostly because of their velour earpads. The soft velvety feeling of these pads is hard to match. They are stuffed with foam that rests spongy over the ears. Over extended listening episodes we didn’t feel that our ears were sweating too much. Velour provides a better thoroughfare of air than leather. Headband comfort: They have added luscious padding to the underside of the headband. It is sheathed in real leather so your dome will be getting the best. The headband is largely made of plastic. It exerts very subtle clamping pressure on the ears. This is not distracting even after hours of movie-watching. Headphone design: The Sennheiser HD 598 headphone is an open-back circumaural can. It sports perfect oval earcups that scoop up the ears in their embrace. There’s no clipping of ears or undue pressure which could taint this picture of tranquillity as it sits on our head. We sound so dreamy because the looks of HD 598 evoke such emotions. Weight: The HD598 headphone weighs 269g a pair. It goes middle-of –the-road with weight. But with its ergonomics, it did not feel its weight. If we had to guess, we would have guessed a lower number for its weight. Wireless Comfort: Since HD 598 is an audiophile headphone and Bluetooth/ANC are usurpers in their shrine of pure music, these are wired. Noise-cancelling capability: Sennheiser HD 598 is an open-back headphone. So, all expectations of passive noise isolation go out the window. 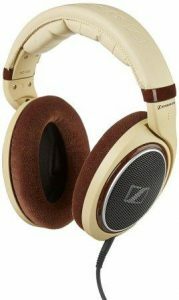 Sennheiser HD 598 headphones are designed to look like vintage pieces. They use beige construction highlighted by “Burl Wood” veneers on the ear pieces in dark brown. The velour earpads are also dark brown in color. A metal grille with Sennheiser logo plastered on it shows on the backplate of earcups. The earcups swivel a little laterally so that they can align against your ears. The HD 598 headphone comes with a 3m removable cable with a locking 2.5mm port on the earcup. It is tangle-resistant and long enough for studio monitoring or at-home listening. It ends in a 6.3mm studio jack on the other side. As a perk, they include a 6.3mm-3.5mm converter with the pack. It is not accompanied by a carry case to drive the ‘studio-headphones’ point home. Since the Sennheiser HD 598 headphones have an open architecture, they exploit it for a wide open soundstage. The spacious acoustic area easily accommodates a well-defined stereo image. The audiomimics the natural sound well and engulfs your head instead of sticking inside it. There’s a load of oomph in the lower-registers in spite of the open design. So they handle simple and complicated bass track equally well. HD598 wins hand down in the clarity and detailing of sound. Midrange is filled with intricacies that we did not hear with other headphones in the same price range like Sennheiser HD 580.Even the treble is highly detailed and energetic to match with the bass. They sound best when driven by an amp but they work just as well when connected directly to portable devices. and a serious audio signature that entices audiophiles and casual listeners alike. These are exceptionally well-built and comfortable. Plantronics has executed all the features extremely well. And all this rounds off at a very affordable price. What’s not to like about one of the most comfortable headphones? 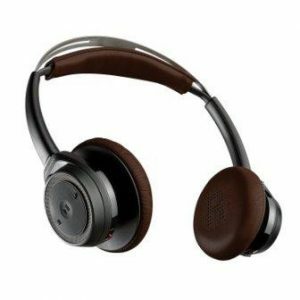 What makes Plantronics BackBeat Sense the most comfortable headphones in the market? Plantronics made a name for itself in the Bluetooth headset niche. When it entered the headphone market, it brought only the most professional features forward. Earpad comfort: The BackBeat Sense is loaded with circular earpads. The cushions are made of memory foam and eventually conform to the shape of your ears. There are a number of perforations on the earpad to allow more air in. The Left and Right labelling goes clearly on the earpad. Headband comfort: The headband of these headphones has a partial suspension design. These have a padded layer that sits directly on the head. It self-adjusts to the shape and size of the head. It is restricted by a second metal band for maximum extension. The metal band has 10 size settings. The clamp is minimal. Headphone design: The earcups of the Sense headphones swivel forward to adjust to your head shape. They also swivel 90° to sit flat on the neck or in a case. The controls are easily operable with dedicated buttons for track control though they aren’t integrated with PCs and desktops. Weight: The weight of these Plantronics headphones is perhaps its biggest strength. At a mere 4.9 ounces, these stretch credulity with their features. This makes for a snug fit without much clamp. Noise-cancelling capability: These headphones have no active noise isolation, these offer good passive noise cancellation. The Plantronics BackBeat Sense headphones are a handsome pair for everyday use. They are available in either black or white with brown cushions. The headband frame is metal and even so the weight it racks up is just 140g. The quality of build is impressive at the price. On the left earcup, the edges act like a volume ring. The right earcup has the multifunctional button along with track navigation buttons. These headphones have two highlight features. One is the Proximity sensor which is built into the left earcup. It senses when the headphones are off your head and automatically pauses the music. It works well 80% of the time. Sometimes it keeps playing while on your neck and sometimes pauses the music when you turn your head. You can turn it off by pressing and holding the multifunctional button for 6 seconds. The second major feature is the OpenMic feature. It engages the dual mics to catch and amplify ambient sound. It is activated with a red button on the left earcup and allows you to hear outside world up to 4-6m without taking off the headphones. It makes them cool spy gear. The battery of the BackBeat Sense headphones last through 18 hours of music playback. You can also use them in the wired mode. They come with an audio cable and a classy snapping case with pocket for the cable. These double as excellent headset with crystal-clear calls. The Plantronics BackBeat Sense headphone have surprising maturity for the price. They give the more expensive Bose SoundLink a run for their money with a more audiophile sound signature. These are highly balanced without even the slight mid-bass bump that SoundLink has. They have a natural sound with tight punchy bass, clear mids and detailed treble. The audio is more forward than SoundLink. SoundLink has a meatier bass and more warmth to the audio that bass-heads will prefer over Plantronics. These headphones can handle complicated music with ease because the bass is fast on its feet. The audio is decently open-sounding. With Apt-X compatibility, these leave nothing to chance. The open-ness brings plenty of details to light without being revealing enough to damage the bad recordings. headphones. The MDRXB950BT Extra Bass Bluetooth headphones are no exception. They embed your head in long-lasting comfort while satisfying your bass desires. The bass-boost option leaves something to be desired in terms of clarity but the regular music mode has Sony’s timeless grace. Meanwhile, it unties you from cables and boring audio connections. There were a Million reasons to put it on the most comfortable headphones list but only one reason to make it stay: comfort. 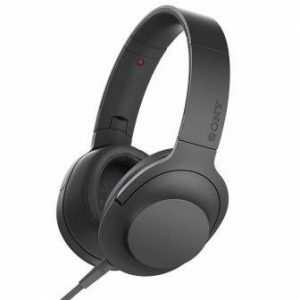 What makes Sony MDRXB950BT the most comfortable headphones in the market? Sony is a trendsetter in the audio place. Its years of revered legacy are reflected in the smooth contours of Sony MDRXB950BT headphones. It aces the comfort game for many reasons. Earpad comfort: The earpads of Sony MDRXB950BT headphones rest around the ear with a lot of poise. The cushy material makes a thick circle on the earcup. So much so, the earcup cavity is spacious for the ears. Although this adds to the weight of the headphones, we would take them over shallow, clamping headphones any day. Headband comfort:Sony MDRXB950BT headphones uses brushed steel in the headband part. This is a sturdy bridge with cushioning in the cranial area. This gives the sides of your head some breathing space while dulling the impact at the top of your head. The band is chunky and distributes the weight of earpads evenly. Headphone design: Sony manages to keep round over-ear earpads in the game. Not once do you feel the thrust of the round shape on your ears. The reason is that Sony builds dorky headphones. The earcups are large enough for your ear to be completely submerged in the central cavity. The padding is so plush that your ears will not touch the bottom of this cavity. This creates a nice acoustic shelter for them. Weight: Given the brawny body of the MDRXB950BT headphones, we were surprised that they clock only 283g weight. This is a middle-of-the-road figure for over-ear headphones. For nominal weight gain over that of lightweight headphones like Bose QuietComfort 35, MDRXB950BT headphones add a whole lot of ear padding. Wireless Comfort:While these headphones are also available in the wired model, this Bluetooth-enabled design is obviously more convenient to use. Bluetooth connection is seamless with Android and iOS devices. The reception is clear within 33 feet from the playback source.You can also pair these headphones via NFC by just tapping them against an NFC-enabled device. Noise-cancelling capability: Sony MDRXB950BT headphones do not feature ANC. But with the engulfing fit of the earcups, they cut out a lot of ambient noise. Their passive noise cancellation is one of their top abilities. Like we explained, Sony MDRXB950BT headphone is going make your head look like Bigfoot’s cousin, Bighead. If you have a naturally large dome, these might blend in. The entirely charcoal black architecture has thin red highlights on the earcups. All the buttons are positioned at the bottom of either earcup within easy reach. There’s a port for the audio cable accessory to connect here as well. This way the headphone can be used in wired mode when out of power. The battery life lasts through 20 hours per charge. In stand-by mode it will get through 200 hours. The Bass Booster functionality only works on battery power. There’s an internal mic on the Sony MDRXB950BT headphone which allows you to make hands-free calls. It’s a useful facility but the call quality is not up to standards when you call from a crowded place. Sony has shown some brilliant craftsmanship in the audio of MDRXB950BT headphones. They sound clean as a whistle. In the normal mode, there’s a healthy dose of bass, simultaneously oomphy and tight. They play complicated music with practised ease. Each and every detail is played and highlighted in the midrange. The highs occasionally miss the step. But when they don’t, even the higher frequencies are strangely moving and visceral. The Bass Boost mode is both a bane and a boon. If you are a basshead and you listen to a lot of EDM, Techno or Hip-hop, this mode will fulfil all your bass dreams. However, it overplays its hand in more subtle music including the less bassy tracks. For most part audiophiles will steer clear of this mode of Sony MDRXB950BT headphones. their latest QC35 is already on the most comfortable headphones list, we can hardly ignore the talent of the QuietComfort 25 headphones. They laid the foundation for QC35’s advantages with their low weight and world-class ANC. QC25s held the throne in the most comfortable headphones list before QC35s. What makes Bose QuietComfort 25 the most comfortable headphones in the market? Bose has set the thresholds in comfort and ANC with the QuietComfort headphones. QC25 headphones impress us with their attention to the little details that make them extremely comfortable to use on long hauls. Earpad comfort: QuietComfort 25 headphones pamper you with soft squishy leather earpads that are extremely easy on ears. They fit all ear-sizes well with good clearance inside the earcups. The ear pieces rotate to align to your head shape. Headband comfort:Bose QC15 headphones had a more arched headband that would sit loose on your head. But QC25 has flattened the arch to fit the cranial portion of your head snugly. This helps if you are move your head a lot. QC25 does not dislodge with the jerks. The underside of the headband is padded with a sturdy yet comfortable material. Headphone design:The Bose QuietComfort 25 headphones use oval over-ear earcups. They circle the ears and are big enough to house pint-sized to elephantine ears. Weight: Here’s an area where the QC25 beats its successor and most other headphones on this list. Without its wire, it weighs a mere 196g. This quality makes a substantial difference to how agreeable QC25s feel on our head. The build quality does not suffer though. Granted QC35s are more robust but QC25s are above average in sturdiness too. Wireless Comfort: Unfortunately wirelessness did not catch up with the QC line until QC35. So QC25s are wired. Noise-cancelling capability: QuietComfort 25 headphones sport Bose’s sterling Active Noise Cancellation technology.QC25 was so good at this that QC35 inherited the same.So both banish external noises equally well. QC25 also has the eerie radio silence quality like QC35 when ANC is active. The black and silver design of the QuietComfort 25 headphones is both comforting and trademark Bose. They took a bold step up from QC15 and revamped the build to make QC25s more durable. They tread a fine balance between low-weight and form reliability. The earpieces pivot on cast Zinc hinges and fold inwards into a compact package. There are two bundles of QC25 headphones. One comes with a detachable Apple-compatible cable and another for Android. The difference lies in their in-line 3-button remote. The ANC functionality works on AAA batteries that go inside the earcup. You can have 35 hours of uninterrupted music on one battery. And you can replace them mid-flight. But you must carry spare AAA batteries with you. ANC can be turned off using a button on the earpiece. The most important takeaways from Bose QuietComfort 25 headphones are their ANC and comfort. Take those away and you are left with a good headphone, just not stellar one in their price range. They sport powerful bass which lends body to the audio. But it’s taut and does not meddle with the mids. The mids and highs are bright and clear. There’s a good amount of details in the midrange. If you compare them with similarly-priced wired Sennheiser, you’ll find the latter to be more dynamic and refined. The soundstage of the QC15 headphones is spacious. You get a good whiff of abnormalities from badly-recorded audio. QC25 definitely sound better than QC15 in terms of their energy andwarmth of audio. Their comparison with non-ANC peers just goes to show that ANC needs considerable investment. headphones, the Bose SoundLink has become the golden standard for headphone comfort amongst supra-aural headphones. These lightweight cans offer a heavy-weight performance that bridges the gap between Bluetooth and wired audio quality. Their lightcomfort and portability ultimately led them to the most comfortable headphones list. What makes Bose SoundLink On-ear the most comfortable headphones in the market? These Bose on-ear headphones make even over-ear headphones scamper for extra padding on their earcups. They score big in the comfort department for long hours of use. Earpad comfort: The Bose SoundLink carry small oval ear pieces which are mounted with memory foam flat earpads. These rest with uniform pressure on the ears. In time, the memory foam conforms to your ears and leave no pressure points any more. Headband comfort:The Bose SoundLink headphones have a thoroughly padded headband from ear to ear. The cushion is optimal to just support your head. The clamp pressure is light but sustains the cans on your head even through mildly active exercises and general walking. Headphone design: The earcups of SoundLink can swivel forward in their mounts and hug the shape and size of your head. The controls and the mic are placed on the right earcup. You can talk normally with these on and your voice will be relayed clearly on calls. Weight: The Bose SoundLink headphones are famously lightweight. They weigh a measly 5.4 ounces. That’s as light some of those rickety PC headphones, though there’s nothing rickety about these. The light weight warrants very low clamp pressure to keep them on. Wireless Comfort:The SoundLink headphones are available in both wireless and wired models. The wired equivalent is named Bose SoundTrue on-ear headphones and have the same design. These wireless headphones can be used in the wired mode. 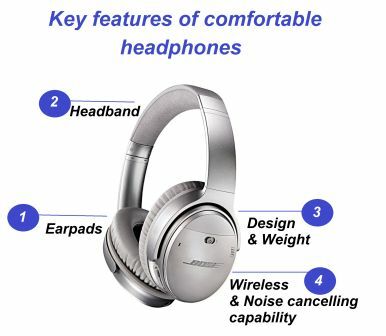 Noise-cancelling capability: The Bose SoundLink on-ear headphones do not have active noise cancellation. However, they offer better noiseisolation passively. 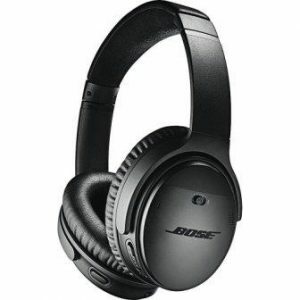 If you are spoiled by Bose QC line during airplane travel, these cannot hold a candle to that, but they can dull down the annoying tap taptap of your coworker. TheBose SoundLink on-ear headphones make a very portable package. These are available in a plain black funk or white version with beige padding and blue highlights. These are lightweight but made of quality materials. The flat earpads have been reinforced at the center with a thick fabric. The right earcups carry a power button, dedicated volume buttons and a multifunction button. The last can also change tracks. The buttons are large enough to operate in the blind. These headphones have an Adaptive Audio Adjustment technology for calls. Through dual mics, this changes the volume of calls based on ambient noise. So even when you are out and about in the urban jungles, the person on the other end of the call hears you clearly. SoundLink operate on Bluetooth seamlessly within the range. The battery lasts through 15 hours on average volume. They do go into power-saving mode when idling for long. They charge through a USB cable. They can also be used in the wired mode when they run out of charge. The accompanying cord is 47.2 inches long. These are foldable headphones which further reduces the already small storage footprint of these supra-aural headphones. The arms of the headband fold inwards and up to fit into the zippered carry case provided with the SoundLink. 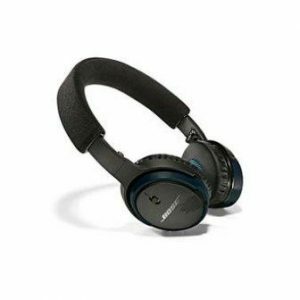 The Bose SoundLink headphones stand apart from other Bluetooth headphones at this price for their exceptionally natural tone. Over wireless, the audio quality is often sacrificed, but Bose is having none of that here. The sound is solid with tight punchy bass supporting a clear and open midrange. The bass extends deep without any boominess. The tones are balanced but there’s just enough warmth to the audio to make it enjoyable. The detailing is better than Beats Solo 2 wireless with a more controlled bass. The treble is smooth and extended well. They sound slightly less exciting in the wired mode. While these comfy headphones may not topple the wired competition at the same price, they offer a good trade-off in terms of comfort and wireless connectivity. headphones. These cans finally prove that nothing stands in the way of good sound, not portability, not design. These are also widely regarded to be comfortable. This deserves double applause since these are supra-aural headphones. The excellent build quality rounds off their welcome into the most comfortable headphones list. What makes Beyerdynamic T51i the most comfortable headphones in the market? Earpad comfort: The Beyerdynamic T51i have round memory foam earpads that sit comfortably on these ears. They are loaded with protein leather that doesn’t easily tear off with continuous use. The foam adapts to the lines on your ears and doesn’t apply pressure on specific points of your ears. Headband comfort:The T51i headphones have a slotted metal headband. This is curved exactly to meet the shape of the normal head. It doesn’t stick out at the arch like some headbands do. The slots helps with air circulation. There’s cranial padding on the band where it touches the curve of the head. Headphone design: The earcups can revolve on their mounts. This allows them to swing around and lay flat on your chest, when you hang them around your neck. They can also swivel forward and hug your ears for a perfect fit. There is no clamp pressure but somehow T51i tends to stay put on the head. The headband can be extended. Weight: These Beyerdynamic headphones rake up only 6.84 ounces in spite of their metal yoke. This leads to reduced clamp pressure that can be handled by a thin and slotted headband. The lack of beef does not indicate a weak structure in any way. Wireless Comfort:Unfortunately, the T51i headphones are not wireless. In fact, they have a permanently attached Y-cable. Although the cable is sturdy, we could help but fear for the life of these headphones, if and when the cable fails. Any accidental yanking could quickly prove fatal to the whole set. Dual-sided cable also restricts movement. Noise-cancelling capability: The T51i have no noise cancelling ability, but they do block out more noise passively than expected out of on-ear headphones. You can listen to soft jazz within your office space unless folks are celebrating Christmas next to your desk. The Beyerdynamic T51i headphones are designed premium. The headband and the earpiece mount are done in brushed metals and so is the back of the earcups. The branding is subtle but gorgeously done. The novel design of the yoke is catchy. These are comfortable to everyone except those with the oddly-shaped heads. While the metal headband confirms with the popular head shape, it is not flexible. Headband extension is marked by numerous clear slots on both sides. This helps you adjust it uniformly on both ends. The cable of these headphones is captive. But they make a very useful improvement over the T51p. They have an iOS-compatible 3-button control and mic inline. The volume buttons do not function with Android though. The 50” cord terminates in an L-shaped plug. These come with a semi-hard zippered carry case. The thrilling audio of the Beyerdynamic T51i headphones is what leaves competition biting the dust. These walk the fine line on a lot of balances, tight but rich bass, open but intimate, detailed but not analytical, neutral but not genre-specific. These are audiophile headphone with excellent detailing and across-the-board clarity. And they have a wider soundstage that some of the open-back over-ear headphones in the price range. The audio is very present and plays around your ahead. Although neutral, the bass of these headphones is superlative in amount and speed. That’s what makes them such a good fit with rock and dance music as well. The sound is full bodied with bass being clearly defined. The midrange has plenty of details which make them sound more resolved than competition lie Sennheiser Momentum on-ears. The Bose SoundLink is warmer and but T51i sounds a tad more detailed and natural. The call quality on the T51i headphone also turned the addition of mic into a highlight feature over T51p. The person on the other end can hear you clearly without holding the mic too close to the mouth. headphones on a budget.They play into the audiophile demand of detailed sound but keep it short of sounding surgical. The attractive colors form a highly comfortable package that suits normal listeners and spectacle-wearing people alike. The sides of our head and back of ears did not show any bruises after taking off these headphones after a Die Hard marathon. If it isn’t one of the most comfortable headphones, then what is? What makes Sony h.earOn the most comfortable headphones in the market? Sony never fails us in terms of comfort. Although they have many circular earcups in their line-up, they have tried to keep up with the trend in the Sony h.earOn headphones. Earpad comfort: Sony has hit the nail on the head with the earpads on h.earOn headphones. They have added a whole lot of padding to the earcups and there’s a deep cavity in the center to nestle your ears. These create an acoustic and physical comfort zone over your ears. Headband comfort:The headband of h.earOn headphones, though hardy, are quite flexible. They easily molded around the shape of our noggin. The clamp pressure was nearly absent from the headband and we didn’t find any issues wearing them over long periods of time.Only that portion of the headband that touches the crown of the head is padded. Headphone design: This time on Sony made the transition to oval earcup. These are over-ear headphones with racetrack oval earpads. The headband and earcup design couple to exert only minimal pressure on your ears. So if you wear specs, these are one of the best headphones to have. They stay on painlessly for hours. Weight: In spite of the bulky look, Sony h.earOn headphones weigh only 227g, thus joining the lightweight headphone hall of fame.They are slightly lighter than our favorite Bose QC35.This contributes to their relatively less clamping pressure. These headphones are neither wireless nor have Active Noise Cancellation. Although the earpads give you a nice blanket, they do not have the same seal as Sony MDRXB950BT. Sony added a splash of color to their repertoire with the h.earOn headphones. They look much more stylish than their older line. To add to the appeal, they have some really cool colors in these headphones namely, Bordeaux Pink, Charcoal Black, Cinnabar Red, Lime Yellow, Viridian blue. The wires are also matched to go with the headphones. There’s an aluminum touch on the backplate of earcups. The cable of the h.earOn headphones is detachable. It is the tangle-resistant variety with a single-button in-line control for taking calls and Play/Pause. This works with both Apple and Android devices. Having the volume controls would have been nice. Both the arms of this headphone are articulating, so it packs up into a highly portable package. The specs are pretty simple and should have demanded a lower price in our opinion. Sony h.earOn headphones specialize in laidback audio. We could look at the headphones in the same price range like Audio Technica M50x which sound great. But their audio is more energetic.H.ear has a punchy low-end which has been slightly bumped in the mid bass region. But the bass is controlled and does not muddy the clarity of mids. As for hi-resolution, the mids give you a good amount of details but the Audio-Technica MSR7 beats it in this regard. h.ear On headphones are amongst the most non-fatiguing headphones of all time. So they are pretty comfortable acoustically also over long periods of listening. The neutral profile suits the audiophiles as well. Casual listeners would want the audio to be a little more aggressive and warm. replicate the cozy comfort of their high-end headphones. These budget Sennheisers boast of above par clarity coupled with an audio signature that favors casual listeners. They close out the world from around you with passive noise cancellation. This is one of the best budget buys and the most comfortable headphones in their price range. What makes Sennheiser HD 419the most comfortable headphones in the market? When we started looking for the most comfortable headphones, we searched in all cost coordinates. 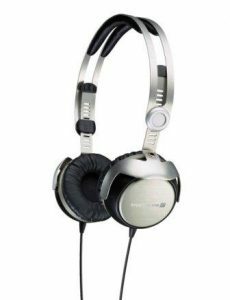 Sennheiser HD 419 headphones are one of those cans which could match up with the more expensive ones on this list. Earpad comfort: The foam cushions on the earcups are thick like those of the HD 598. Instead of velour they have draped these with a velvet-like material. The puffiness of earpads leaves limited cavity in the middle. So these feel extremely cushy for up to moderate-sized ears. Jumbo ears would be pressed by the soft foam and can annoy people with sensitive ears. Headband comfort:The plastic headband of the Sennheiser HD491 treads lightly on your head. There’s foam padding on the cranial arch which is again sheathed in velvety cloth. Headband clamp force is relatively low so your head gets its breathing space and the ears remain unscathed. Headphone design: The HD491 headphones have an over-ear design that goes around the ears. The problem is that the earcup size is smaller than that of HD 595. So folks with gigantic ears will find some pressure on their ears. For smaller ears, it offers the same comfort level as the HD 595 or 598s. Weight:At 198g, the Sennheiser HD491 headphones are as light as the Bose QC25s. The mainly plastic build results in low weight. And it also helps keep the clamp on ears to the minimum. Wireless Comfort: The HD491 headphones are not wireless. However, the cable is permanently attached to one side. This way you have freedom of movement on the other side. Noise-cancelling capability: These Sennheiser headphones have excellent passive noise cancellation capabilities. They close out external noises so you can focus on your music. But beware. The audio does leak out some. Sennheiser has hit the jackpot with comfort under a budget with the HD491 headphones. If you are uninitiated to over-ear headphones, these could give you a good start. The build is mostly plastic but they have used quality plastic that does not become the chalkboard for fingerprints. The all black build is basic and muted for public appearance.The earcups swivel out and also lean towards the ears. This flexibility helps it adapt to many head shapes and sizes. The decision to have the cable one-sided is a smart one. This way there’s lesser chance of tangling. The cable of HD491 is relatively thin. We would have liked to see a more durable cord here.There’s the minor issue of sound leakage when the music is on full-blast. But it’s muffled so most likely people near you will not be able to make out the song. HD491 headphones dip into Sennheiser’s glorious legacy of audio-engineering for a refined sound. The bass is punchy and detailed. It is not as meaty as that of the pricier Sennheiser Momentums though. Bass is kept in check so that the response sounds natural. So basshead listeners might crib about the levels being low for their taste. Midrange and highs are crisp with just enough peppering of details. The soundstage of these Sennheiser headphones can do with more space. Regardless, they sound everybit as good as the brand is hyped to be. portable, durable, stylish and sound great for casual music. These are good-looking cans that you can sport out and about in the city. Their comfort level makes them stand out from the crowd. The audio is surprisingly detailed andwith enough balance to sound different from the bass-heavy affair. They earn their most comfortable headphones chops. 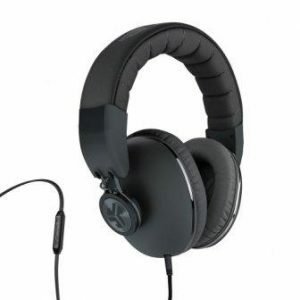 What makes Skullcandy Grind the most comfortable headphones in the market? Skullcandy Grind headphones look brilliant in their many avatars. But they are all style with substance. We go into how these became one of the most comfortable headphones at such a modest budget. 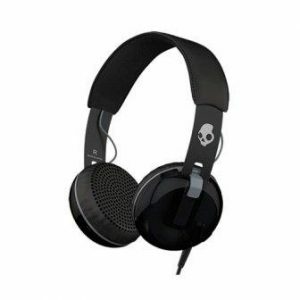 Earpad comfort: The Skullcandy Grind are equipped with very soft, round earpads. They occupy very less area on the ears and let them breathe easily. They also have perforations which allow little more air circulation that the usual flat pads. Headband comfort:The headband is made of metal and lasts through your rough abuse of it with everyday use. The arch of the band is coated with leather padding with mesh on the underside. The mesh is soft andbreathable. The mesh is designed specifically not to create any pressure points on the head. Headphone design: The Grind headphone applies very low pressure on the ears by the way of a clamp. The design is made more convenient by placing the mic and call control on the earcup. This way, you don’t have to pick up and hold the mic close to you while taking calls. Weight: These headphones weigh only 6.4 ounces with its metal headband. At this weight, you can wear them and forget you have them on. The wide headband pad distributes the weight evenly on your ears and head. Wireless Comfort: The Skullcandy Grind headphones are available in both wired and wireless models. We favored the wired model because of its clearer audio. Also, the wired model has features like on-board mic and detachable single-sided cable which make it very convenient to use. Noise-cancelling capability: These headphones do not have an ANC feature. But they do block ambient noise partly. The Skullcandy Grind headphones are a very funky- looking set without going overboard with the color scheme. They aren’t portable as the earcups don’t fold flat. But they still occupy very less space compared to full-size headphones. The earcups are plastic with matte backplates and metal headbands. These headphones are available in 9 colors with really subtle but colorful combinations like Americana Plaid/grey and scout brown/gold. The wireless model is available in a different set of colors. They even have a version with clear earcup backplate. These headphones have a detachable cable that attaches to a single earcup. The mic is mounted on the right earcup along with a multifunctional button. This button is used for call/answer/play/pause. It can also be used for track navigation. Volume controls work differently on different platforms, iOS and Android. The cord terminates in an L-shaped plug. The wireless model has volume buttons and a battery life of 12 hours. It can also work in the wired mode. The Skullcandy Grind headphones come with a V-shaped signature that adds enjoyment to the audio. They are pleasant to listen to without the usual artifacts breaking into theaudio like boomy bass. Even with the warm sound, they are more balanced than bass-heavy headphones at this price. They sound really smooth and allow you to enjoy the audio even if it’s in bad formats. Though these headphones are not as rich and detailed as some of the more expensive headphones on this list, they sound pretty good for the price. None of that jarring sibilance affects them. They function moderately as a headset but they are usable on the go. The Bluetooth model of these headphones have slight peak in the treble area with a bolder bass. This sculpting might be a part of an attempt to make the Bluetooth sound richer. These are still very capable headphones but compete with the likes of Plantronics BackBeat Sense. headphone when it comes to the lower frequencies. Audiophiles should not even dip their toes in its bass-boosted sonic response. As with bass, they overdose on comfort as well. One look at the beefy padding and you’ll know that this headphone is primed to be on the most comfortable headphones list. What makes JLab Audio Bombora the most comfortable headphones in the market? Bombora headphone has the bulky look that goes well on big heads. And it results solely from the extensive measures taken to make it comfortable. Earpad Comfort:There’s no denying the comfort of plush earpads cocooning your ears. The Bombora headphones have thick memory foam circling the ears stitched over with soft micro-suede. These are large earcups and they can completely cover large ears. So people of all ear-sizes will find solace in the earcup size. Headband comfort:The headband of the Bombora headphones is quite broad. It dissipates the weight of the headphones well. It is padded with air-quilted cushion that rests like a mattress against your head. The pads go from earcup to earcup rather than just being on the cranial arch. Headphone design: Bombora is an over-ear headphone. The earpads have a racetrack oval shape that effectively covers the ears without forming any points of pressure on them. Weight:The weight of this item is not specified but we are guessing it comes around 283g. Though that’s not high by any means, there are many headphones on this list which weigh less. But the padding of this headphone makes it much easier to bear the weight. Wireless Comfort:Bombora headphones are wired. Noise-cancelling capability:Although there’s no Active Noise Cancellation on this headphone, the earpads provide plenty of passive isolation. Most of the low-frequency drone is drowned out by the earpieces. Out of the box, the JLabBombora headphones look pretty large. If you have a small head, these will stick off your head.The profile of the headphone is matte black with elegantly placed glossy ring on the earcup. There are 8 other colors available. Build quality looks like it can hold up to some physical abuse. But users have reported issues with the electronic circuitry being rather fragile. We would buy them as more of a desk headphone for office. The cable of the Bombora headphones is detachable and measures 51 inches. It ends in a usual 3.5mm jack. This length gives you sufficient radius to move around your desk. It has an inline remote control. An internal mic helps you make calls using this can. It comes with a fabric sack. JLab Audio Bombora headphones are the bass-seeker’s treasure. If you are a regular bass-lover, you will appreciate the sedate and meaty bass. The low-end has exceptional extension into the sub-bass region. But itlacks the control and refinement of high-end headphones like Sennheiser Momentum 2.0. It bleeds into the mids taking away some details and clarity from the vocals. These differences might not be apparent to folks who usually stick to popular bass-heavy budget headphones. Highs sound normal and smooth. What we liked about Bombora’s sound signature is that it’s pretty relaxed. It does not have the agility to catch up with the details of complicated music. You do not get fatigued wearing these over long rides. They are a lot less likely than the Audio-Technica M50s. to the audio too. Bose tried to go young and hipster with the design while making it extremely comfortable. The audio is characteristically smooth as Bose headphones usually are. They have all the convenience features except the trademark active noise cancellation. These deserve their place on the most comfortable headphones list. What makes Bose SoundTrue the most comfortable headphones in the market? The Bose SoundTrue headphones are designed to be tough on the inside but bright and perky on the outside. Bose has made considerable investment on their comfort. Earpad comfort: The Bose SoundTrue headphones sport oval soft earcups. They are covered with soft synthetic leather and a mesh in the speaker area. The cushion is ultra-soft and feels like little pillows on the ears. They don’t heat the ears much. Headband comfort:These headphones have a seemingly plastic headband with metal reinforcement at the extension points. The band is slim and padded at the cranial arch. The headband can move slightly when you shake your head vigorously. Headphone design: The SoundTrue headphones have an extremely light clamp. The headband and the ear pieces have some flex to them which allows them to adapt to the shape and movement of your head. The earcups can swivel forward in their mount and customize the fitment to your head. Weight: These headphones weigh 6.4 ounces. They are quite lightweight without sacrificing durability. The clamp is minimal and okay to work with during slightly vigorous activities. Wireless Comfort:While the SoundTrue don’t have wireless connectivity, they have a detachable cable. The cabling is easily replaceable too. Noise-cancelling capability: These Bose headphones do not have that stellar active noise cancelling ability. They also only provide minimal noise isolation. These are best used inthe environments where you have minimal noise. Bose SoundTrue headphones are an exceptionally comfortable pair at their current price. They are pretty low-profile with their flat ear pieces and slim headband. But Bose get flashy with the colors. Apart from the black model, you get a sky blue/grey, white/grey and blue/mint versions. These are also available in an over-earversion without noise cancellation and is just as comfortable. The build is solid although that does not reflect in its weight. These headphones have a detachable cable. It connects to the left earcup via a generic jack. There is no locking mechanism that could force the use of a proprietary cable. There’s a 3-button control inline. All the buttons wok with iOS devices. The volume buttons do not work with Android/Windows. The call quality on the microphone is good. The earcups of the headphones fold inwards for easy portability. Bose supplies a padded zippered carry case. The SoundTrue headphones go for the safe Bose sound signature: balanced and smooth. Unlike many headphones in this price range the audio is somewhat neutral with slight warmth creeping in. It does not disturb the mids. The audio sounds a natural as it can without being too revealing like the Sony 7506. The bass is meaty with good extension into the lower frequencies. The midrange is detailed decently for the price. The treble is smooth around the edges and never gets too sibilant. They makes most of the music genres and formats sound good. Just when you thought nothing could be cheaper thanJLabBombora on this list, bam come the Sennheiser HD 201 headphones. These beat the price to sound crystal clear. Sennheiser walks the difficult line of balance in terms of audio response. Their all-out padding and construction get max points for being comfortable. If money is the priority for you, this is one of the best buys and most comfortable headphones to have at this price point. What makes Sennheiser HD201 the most comfortable headphones in the market? Sennheiser doesn’t take away from the ergonomics to keep the prices low. This is evident in the case of HD201 headphones. Earpad Comfort:Sennheiser HD201 uses foam-padded ear pieces with leatherette drapes. These are user-replaceable. So if you are particular about comfort, you can get velour earpads for them. The earcup moves back and forth to keep the earpads aligned around your ears. Headband Comfort: HD201 headphones sport a moderately wide headband that can handle their weight without weighing your noggin down. Headphones Design: These are over-ear headphones. They have racetrack oval large earcups that swaddle the ear form the outside. The ears rest in the cavity of ear padding. Small to large ears fit in here. Weight: At 317g Sennheiser HD201 headphones are heavy. But you don’t bear the brunt of this weight because of their overall comfort and weight dissipation. Wireless: It is permanently wired. Noise Cancellation: Due to the large earcup size, the ears are cut off from outside noise well. So, passive noise cancellation receives a thumbs-up here. Being a basic headphone, Sennheiser HD201 does not have a long list of features like its illustrious cousin PXC550.It is seemingly flimsy because of its plastic build. But upon testing we realized that there’s a strong core inside it. It does not break easily. The design is all black with the Sennheiser logo in grey color on the backplate of the earcups. The discrete looks helps when you are on the subway and don’t want to be disturbed with questions about ‘you’re pretty headphones’. The cable of Sennheiser HD201 headphones is permanently attached on both sides. This causes some inconvenience with tangles. It ends in a regular 3.5mm plug. Although the opinion on its bass performance is divided, everyone unequivocally agrees that the Sennheiser HD201 is one clean-sounding headphone. The bass has its rumble but it stays toned down in interest of maintaining balance. It extends well into lower frequency but without much kicky power. The midrange is crisp with decent amount of details. The highs tend to get sibilant, especially for female vocals. If you are the kind that likes this bite in the high frequencies, these might suit you. Bear in mind that HD201s only get moderately loud. If you require ear-splitting volume levels to function, then these aren’t for you. headphone-wearing, we explored the Sentey’s line-up for music-oriented headphones with the guarantee that these will be comfy. The LS-4420s made the cut. They tread a fine line between bulky build and large earpieces.So we had no issues touting them as one of the most comfortable headphones. What makes Sentey Warp LS-2240 the most comfortable headphones in the market? Sentey Warp headphones wrap your ear in lavish padding and acoustic seal from outside. Their comfort quotient is quite high. Earpad Comfort: Sentey LS-2240 headphones feature foam earpads with leatherette covers. The protein cushion gives you skin-like feeling around your ears. This rests around the ears rather than on it. The foam is forgiving and lends into the curve of your head for better fit. Headband Comfort:The headband has soft silicone-like padding all across the crown of the head. With its width it manages the weight of the headphones well. The tension is optimum and does not clamp down hard on your noggin. Headphones Design:Sentey Warp is an over-ear headphone. It has racetrack oval large earcups to accommodate a full-grown ear. It is spacious to the extent of looking almost big on the head. Weight: We were not encumbered by the weight of Sentey Warp headphones. Wireless: It sports a detachable single-sided cable. Noise Cancellation: The jumbo earpieces put a physical barrier to keep the noise from creeping inside the earcups. There’s no active noise cancellation. Sentey Warp LS-2240 headphones intersperse red in their all-black body to look classy. The highlights are subtle on earcups and headband padding. There are metal hinges on the arms which are used to fold them while storing the cans. Being one of Sentey’s pricier headphones they have a hep quality to their looks. The cable of this headphone attaches to one side using a 3.5mm jack. This cable is easy to replace but you wouldn’t need to do so since the supplied cable is pretty sturdy. The whole construction adheres to the same quality standards. It is shipped with a carry case. 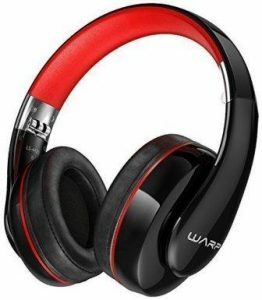 Sentey Warp headphones strive hard to match the sound signature of similarly priced Sony and Sennheiser headphones. They deliver decent audio by the standards but not extraordinary. The bass is present with its punch. But it needs a bit more power in the low end. You will end up pumping them up with equalizer. The midrange of these headphones has enjoyable details. They remain clean of bass’ interference. The highs are equally crisp. The microphone quality is also moderate. You can make and take calls without sounding like Zombies are harassing you.